Two demonstrations that show the effects of atmospheric pressure. Atmospheric pressure is the pressure at any point in the Earth’s atmosphere created by the weight of the air above the measurement point. Two classic demonstrations are widely used in schools to clearly demonstrate this pressure. Cans can be purchased for this purpose which include a strong screw lid. If you are using these then simply pour about 2cm of water into the can and using tongs, heat the can directly above a Bunsen flame. Once the water boils vigorously and starts to steam, carefully using heatproof gauntlets, screw the cap on tightly and leave to cool. Through heating the water, it turns to a gas (steam) When the lid is screwed on and the can left to cool, the steam inside turns back into water leaving little air inside. This lack of air creates a difference in pressures outside and in which collapses the can. Another way this is done is by using an empty drinks can. Again add water to a depth of around 1-2cm and heat with tongs using a Bunsen. When boiling, invert the can quickly into a sink filled with cold water. The sudden change of pressure makes the can crush very quickly usually causing a loud pop. Be very careful not to spill the boiling water when inverting the can. 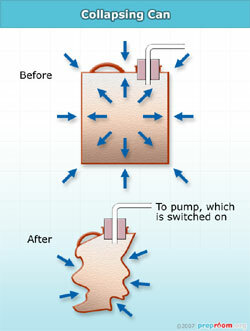 The collapsing can in the picture (fig1) can be collapsed using a vacuum pump. A commercially available collapsing can can be made to collapse using a pump by inserting a bung with a hole in the mouth and connecting a length of pressure tubing to the pump. These consist of two heavy metal hemispheres which can be joined together. 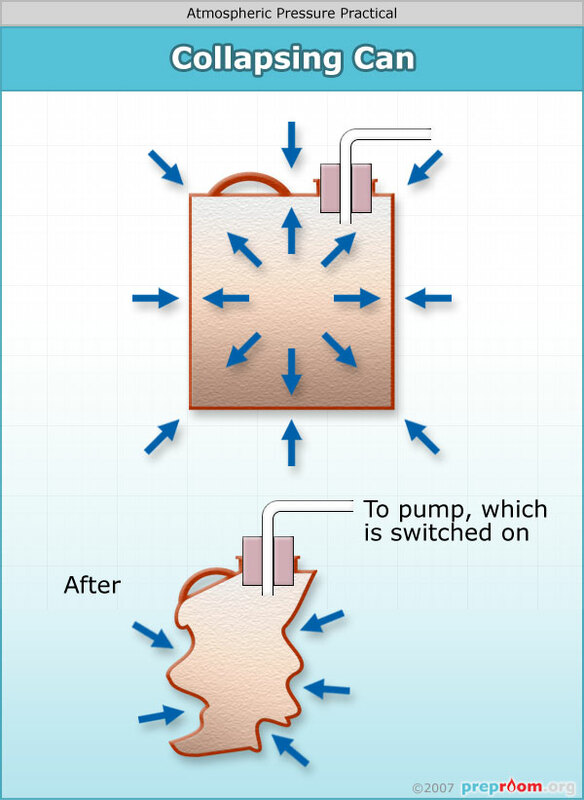 The air from inside the two can be expelled using a vacuum pump. This difference in atmospheric pressure inside and out makes the hemispheres very difficult to part. More details about Magdeburg Hemispheres can be found here. These demonstrations work because of a difference in atmospheric pressures. With the can, under normal circumstances, the pressure inside the can and outside is equal. This means the can is stable. If you remove the air from inside, the pressure outside is too much for the structure to take and the can will collapse under the force. With the hemispheres, the removal of the air between them enables the massive pressure outside to hold them together. With the collapsing can – use eye protection and heatproof gauntlets. Heat the can using tongs capable of holding a can firmly. When upturning the hot can, ensure that no boiling water can splash anyone. With the Magdeburg hemispheres – Great force can be required to separate them - be aware of this.